The Sparrow iPhone app is here! The app costs $2.99 in the App Store and lets you connect your email accounts and Facebook contacts. If you’re already using Sparrow on the Mac you’ll be glad to know the Sparrow app on the iPhone offers familiar features, and has added a slew of new innovative features that help unleash the full power of the iPhone. and now you can use on screen touch gestures in the application to get a lot more productivity out of your email. I personally love the Unified Inbox, the step based compose screen, the cute ding sounds when you get new email and the loads of customizable features that you won’t find in the standard Mail app on the iPhone. For this review I tested the app on an iPhone 4S using 2 different Gmail accounts and found it to run extremely smooth without any lag issues. Avatars are visually helpful and even better with Facebook connect. When you start the Sparrow app the first time on the iPhone, you’ll go through a simple setup step along with a quick intro tutorial section. You can quickly add your first email account by adding a Name, Email address, and Password. To compose an email tap the blue icon which is always present on the bottom right of your iPhone. This screen for better or worse follows a step by step process. First you pick the “Send to:” recipient(s) which is nice since you’ll see a list of contacts filtered as you type, along with avatars. Tap next to type the Subject and your email message. Once you’re done tap the Send button. On the title screen you see the Email Account the message is being sent from. You can quickly change that account in Sparrow, just tap the title to pick a different account from the list. As you change the account the signature changes in your email as well. Sent mail notifications use a fun new sound in Sparrow as well which is a nice change from the Mail app. You can swipe to reply, star, label, archive or delete email conversations. To navigate a conversation you can swipe up or down. Toggle through your email inbox, unread, and favorites (starred in Gmail, or flagged in Mail) by tapping or swiping the top title bar in the Sparrow iPhone app. This unread feature is a really useful feature especially on the iPhone if you have multiple unread emails from multiple accounts. Sparrow for iPhone uses a slide deck navigation style, similar to the old Twitter app. Tap the panel icon in the top left of the screen (or just swipe right), and the list of your email folders slides into view on the left. Here you’ll find your Inbox, Sent Mail, Drafts, and Labels for your Gmail accounts. The colors attached to your labels are beautifully presented (although not accurately, more on this later) in Sparrow for iPhone, which is a treat. Swipe right one more time to view the Accounts section of the app, where you can view and add all your various email accounts. Once you’ve added more than 1 email account, you’ll see the option for viewing the Unified Inbox in the Sparrow app. Reading emails on the iPhone with Sparrow is very effectively thought out. Besides the avatar feature, you also have a thread view for conversations, which is really clean and useful. You will see a count of the total messages (ex 2 of 5) in the title bar. Tap the title to see a clean numbered list of all the emails in the thread, and pick one to jump to. Or just swipe up and down as you’d expect, and Sparrow jumps around in the thread for you. Tap the blue Up arrow button to reveal more options when reading a single mail. Here you can Compose a new email, Forward, Star, Archive, and Delete. The buttons are a bit cramped and you may have to be careful when hitting delete vs. archive here. To Reply tap the button on top of the screen. To Reply All in Sparrow actually requires a second action. Once you’re in a reply screen, if there were more than 1 recipients involved, you’ll see a reply all button you can tap. Next to that is also an attachment button. What’s great is you can either take a photo or choose a photo from your library to attach to an email. This is a wonderful feature. No more having to go into your Camera Roll to send out photos. And you can keep repeating this step to attach multiple photos. When you are in the Accounts view, you’ll see a “+” button and a settings button. In the app’s settings you can customize sounds, pick a signature, avatar, alias and more. You can pick an avatar form your iPhone’s photo library or take photo to use. You can manage aliases for sending emails, good for having different email accounts or name variations handy. Only 1 signature is allowed per email account. Sounds can’t be fully customized but can be either on or off. There are a couple of buttons for refreshing your contacts and labels, which might be useful if you find them to be out of sync with you email provider’s server like Gmail, Yahoo, Exchange, AOL, or any other account that supports the IMAP protocol. Other settings here allow you to choose a default email account for composing new emails, set appearance options, change advanced settings, and manage your social networks. You can show a range of resent messages in the inbox (25, 50, 100, 200, 500, 1000) and preview anywhere from 1 to 5 lines per email. There is even an option to hide or show the Priority Inbox, which is the new idea Gmail is pushing these days. Few more options are to always reply all, archive and label, reversed thread, and changing the function of the panel button. For whatever reason I’m not able to get the Facebook connection to work right now in the Sparrow iPhone app. When tapping the Connect button it doesn’t go anywhere. Note: Sparrow is not to be blamed for most of these limitations, as they are governed by Apple and their lack of an overall API for 3rd party apps across the iOS. 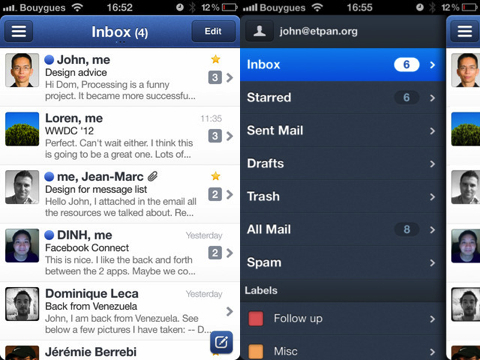 – You can not change the default Mail app on the iPhone. This means if you start using Sparrow as your go to app for email, you’ll still need to have your email accounts configured in the Mail app. When you want to use the “Mail Link to This Page” feature in Safari or “Mail Link” in Twitter etc. the app that iOS loads will be the default Mail application. – No Push Notifications. The current version of Sparrow for iPhone lacks push notifications. The badge number on the icon doesn’t get updated while the app is running in the background, so you won’t know if new mail has arrived unless you manually open up the Sparrow app. This is irritating to say the least but a limitation that is being worked on by the Sparrow team. They actually submitted a version of the Sparrow app with Push support but it was rejected by Apple. You can read more about the Push situation on the Sparrow blog and sign up to be notified when they add a Push notification feature. – No Exchange Support. Unless your exchange server has been configured to support IMAP you can’t use Sparrow to check your mail. This leaves most corporate and educational users with Exchange accounts out in the cold. For now the only app that supports Exchange on the iOS is the default Mail app from Apple. – No POP Support. If you are still using old POP3 accounts or have an email account with hotmail, MSN, Live or any other email service that does not support IMAP, you can’t use Sparrow on the iPhone. – No LDAP Support. Sparrow doesn’t have a built in connection to your LDAP contacts directory. It does make up for this by pulling in your contacts from your Gmail and Facebook accounts. 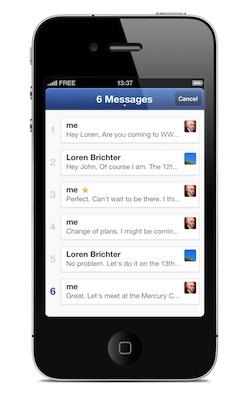 – No iOS app integration (ex Calendar, Contacts, Phone). This means while reading an email you won’t be able to create a calendar event from a date, call a number typed in an email or add someone to your native Contacts app. – Requires iOS 5. If you’re still on iOS 4.x versions, time to upgrade. – You can’t attach multiple images at once, but it is doable if you don’t mind repeating the attachment task over and over. – Label Colors don’t match Gmail account. While Sparrow has done a great job pulling in colors for your Gmail labels, the colors are wrong. It seems as though they are just using arbitrary colors and if you’re used to a specific color on a specific label already, you might be a bit thrown off at first. Overall, The only feature we can’t get to work is the Facebook connect. Also the multiple step compose window can get to be cumbersome if you write a ton of emails on the iPhone. 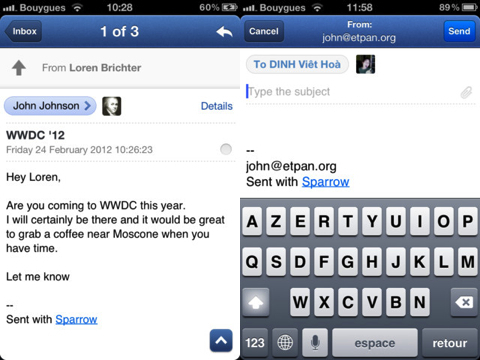 Sparrow for iPhone is by far The Best iPhone Mail app we’ve ever seen. The app gets a high 4 stars from us, for having done a wonderful job of bringing an already amazing piece of software to the iOS. Highly Recommended and well worth the three dollar price tag. Let’s hope some of the issues with the app mentioned are addressed soon. How do you feel about Sparrow on the iPhone? Are you making the Switch from Mail? 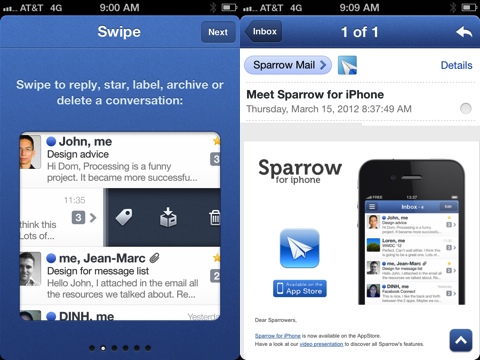 AppSafari review of Sparrow was written by Joe Seifi on March 15th, 2012 and categorized under App Store, Email, Featured. Page viewed 8086 times, 5 so far today. Need help on using these apps? Please read the Help Page. How can you give it 4 stars with no Push Notification? Did I miss something? 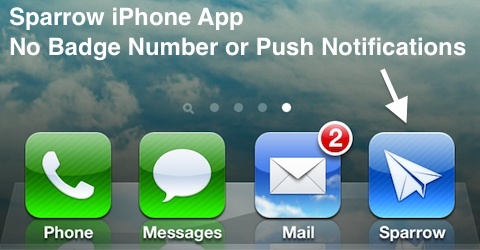 Sparrow even says it does not support Push Notifications. I’m confused…isn’t that a major part of a ail program…no offense Sparrow. Who wrote this? I take it back. Give it a 4! I loaded it and I’m using it with iCloud…maybe I don’t understand PUSH but my emails are coming in just fine & on their own. @ Tarik2nu Thanks for the review. I’ve now posted an update to the app review after a full day of use and have noted the missing pieces, including the lack of true push support. Our rating has been knocked down from 4.5 to 4 to account for the issues. Interesting to see you’re getting the iCloud to work with push notifications. Are you using a .me email account? and are you seeing the badge count increase while the app is running in the background? What I miss in Sparrow is the option to delete messages directly from the server. And does Sparrow integrate with iCloud? I’d love to sync the app with Sparrow on my Macbook Pro. How does any online article get posted without a date? If you’re not going to keep the information always up to date, put a date stamp on it so I know if it’s from a year ago or last week.